We propose to improve the M6 by making it a smart motorway between junctions 13 and 15. We installed a new concrete safety barrier and improved the drainage system in the central reservation from junction 15 to Yarnfield Lane overbridge. Following the completion of the central reservation work, we have changed our traffic management layout in this area and are using a ‘contraflow’. This means we now have one lane of traffic heading northbound running on the southbound carriageway. 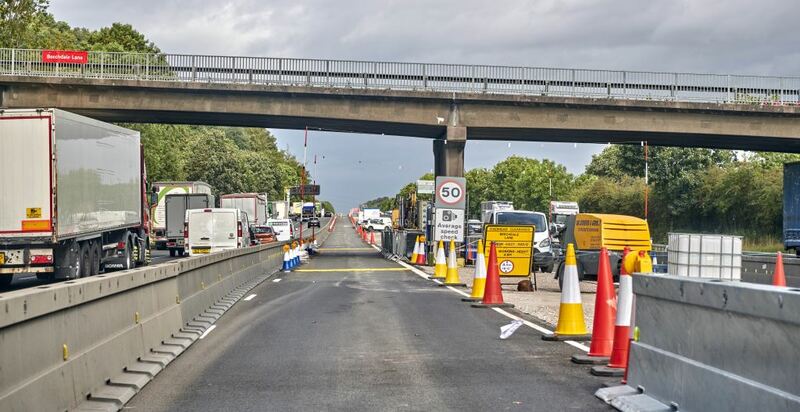 This will allow room for the next phase of work to start in the verge on the northbound carriageway between Yarnfield Lane overbridge and junction 15. 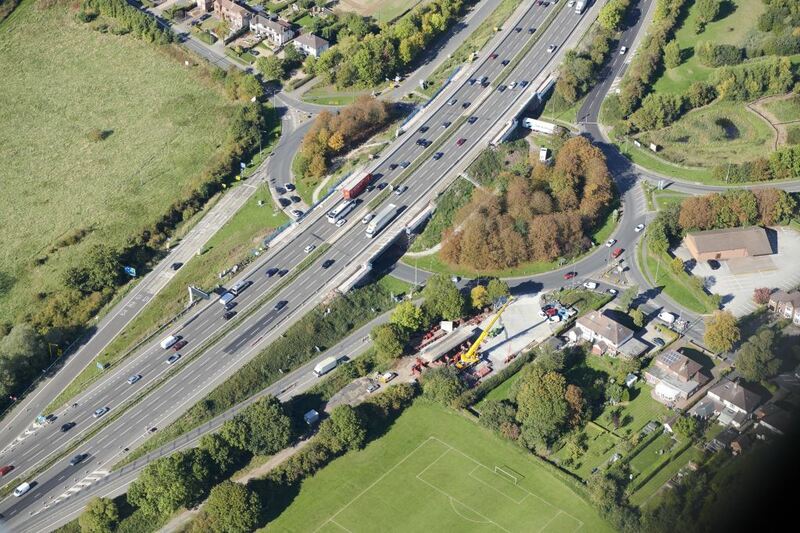 Work is now well underway on the section of central reservation between Yarnfield Lane overbridge and junction 14. 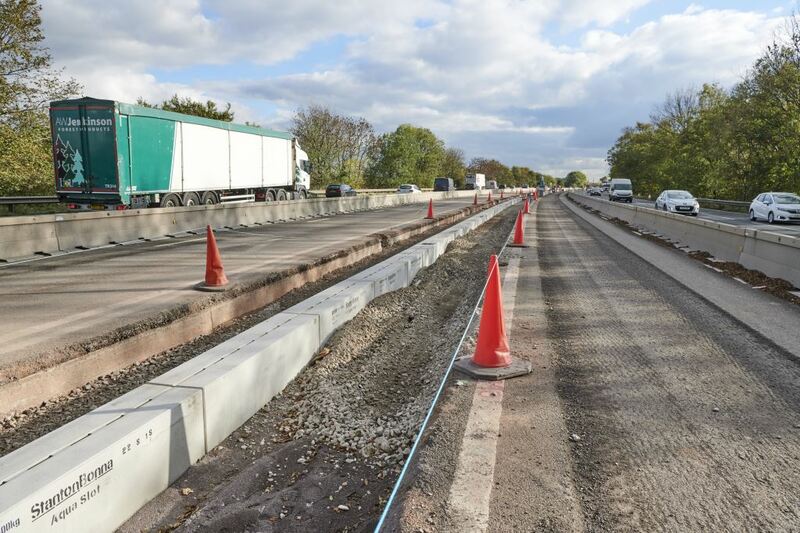 We are removing the existing steel barrier, excavating the centre of the motorway, installing additional drainage, resurfacing and fitting the new concrete central reservation barrier. This phase of work will be in place until early 2020. The digital version of our February newsletter is now available. Following the installation of the contraflow, we will now start work in the verges between Yarnfield Lane overbridge and junction 15. Vegetation clearance has already started prior to bird nesting season and, once complete, we will start some of the heavier construction activities. These will include the installation of new drainage, constructing emergency areas, and upgrading railway bridges to include new safety railings. In addition, we will be installing 13 new gantries in the verges, requiring the construction of foundations. 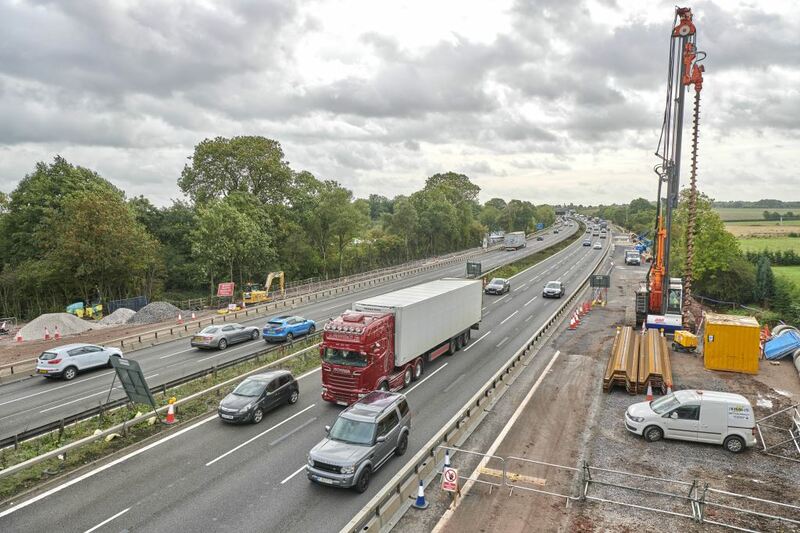 These gantries will hold the technology that monitors and controls the motorway traffic. This is all needed to prepare the hard shoulder to be converted into a permanent traffic lane and allow for all lane running. Please view our diversion routes in the section below. 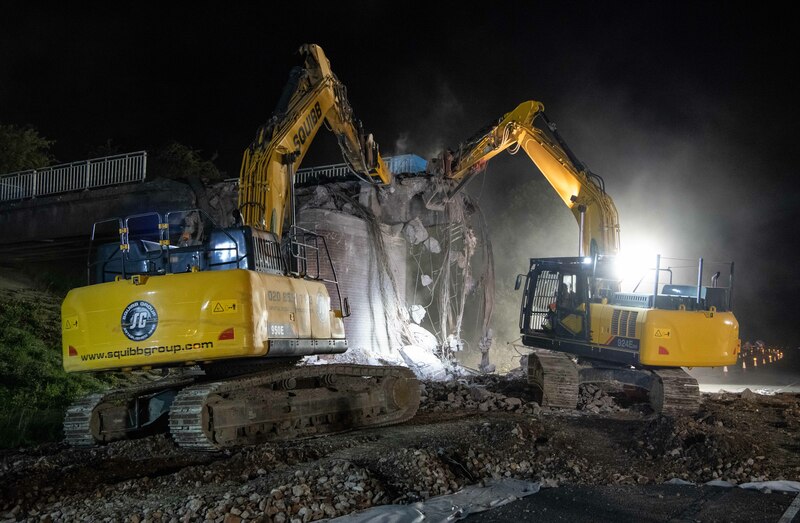 Over the weekend of 23 and 24 March 2019, we closed the M6 between junctions 13 and 14 overnight to demolish Burton Bank footbridge. We demolished the bridge successfully and were able to open the motorway by 7.30am, which was earlier than we anticipated. 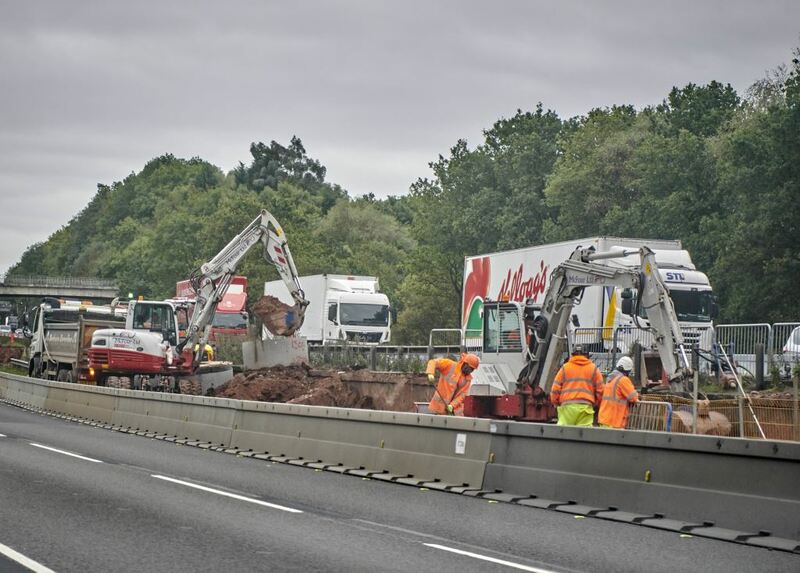 We recognise that there is never a good time to close this busy stretch of the M6 and would like to thank you for your patience during this work. 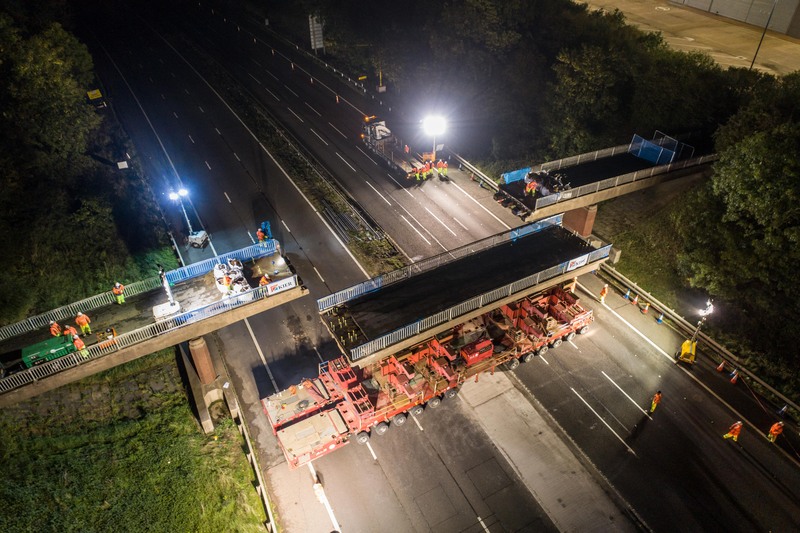 We had to demolish the bridge because there wasn’t enough headroom for heavy goods vehicles between the hard shoulder and the footbridge to allow for all lane running. We worked throughout the night to prepare and demolish the bridge. Once it was demolished, we carried out a massive clean-up operation to make sure we could open the motorway as soon as possible. 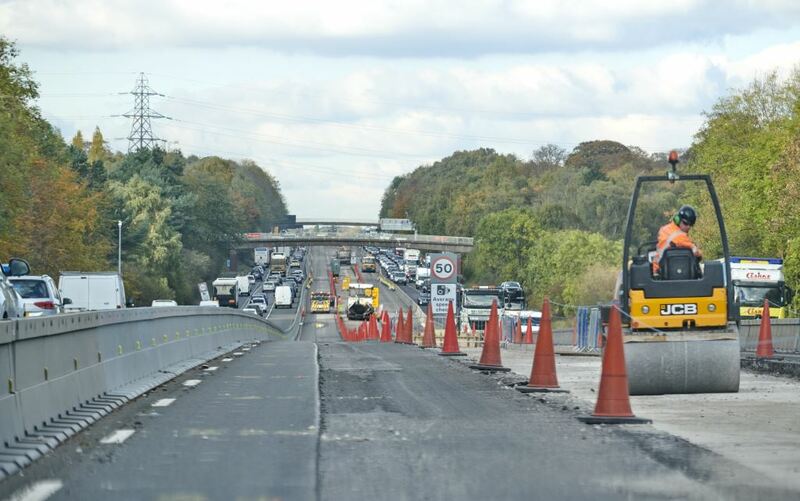 Work started at 5pm on Saturday when we reduced the motorway to one lane in both directions. This allowed us to start building the protective covering, which we put across the motorway to protect the road surface once we started the demolition. 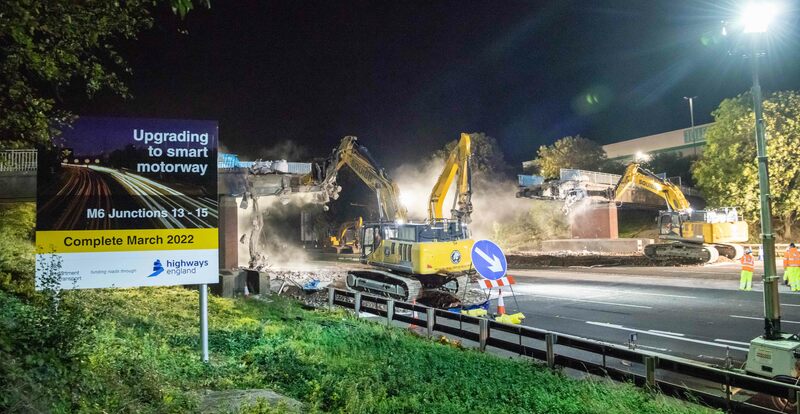 We demolished the 143 tonne bridge using two large machines to ‘munch’ through the structure. By 11.50pm on Saturday 23 March the bridge was safely on the ground being crunched into smaller pieces ready for removal. While the motorway was closed, we also used the opportunity to carry out other activities like replacing the barrier and white lines. What is a contraflow and how will it benefit you? A contraflow is a temporary arrangement where traffic is transferred from its usual side to share the other half of the carriageway with traffic moving in the opposite direction. This layout will provide a wider working space in the verge, allowing our teams to safely speed up certain construction activities. A contraflow will reduce the amount of overnight closures we need by around 60%. This will benefit road users and residents living on diversion routes through Stafford. 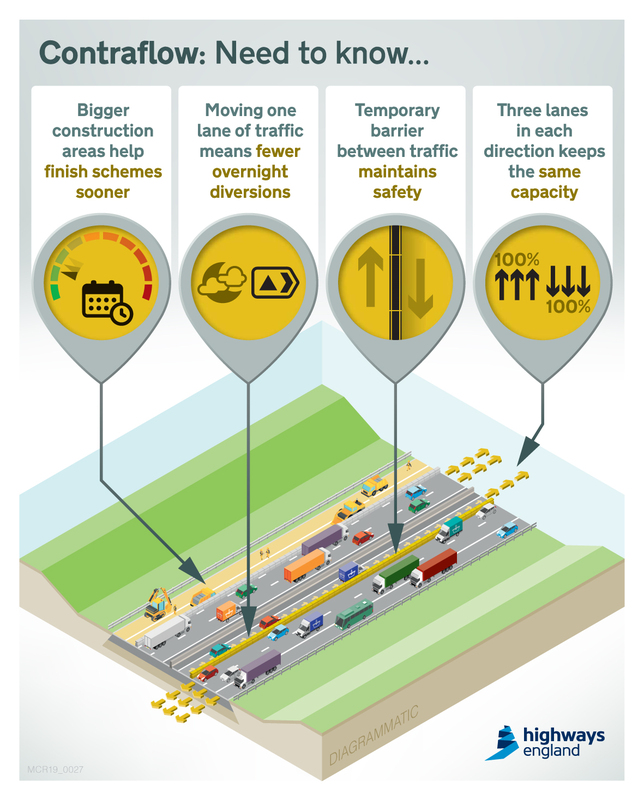 A typical smart motorway scheme will require approximately 200 full motorway closures to complete construction activities using narrow lanes. However, by using a contraflow arrangement, we are able to reduce the number of full closures to an average of 60. This is because contraflow allows us to carry out larger activities that are normally carried out overnight, during the day. As there is more space in the verge to work, site vehicles will be able to pass each other without having to wait until another team has finished an activity. 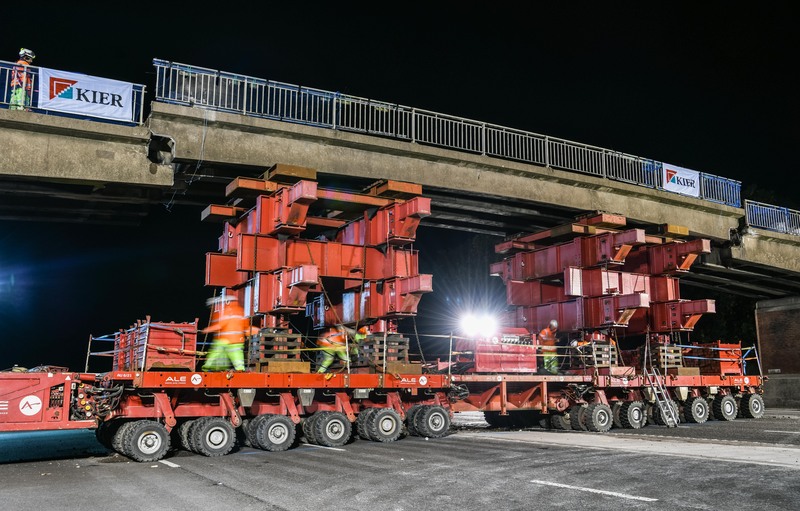 As there will be less traffic management to install overnight, this gives us a greater working window to complete the project quicker and more safely than traditional ways of working. Please note that road users wishing to exit at junction 15 will need to remain in lanes 1 and 2 as they drive through the contraflow. This route experiences heavy congestion at peak time. 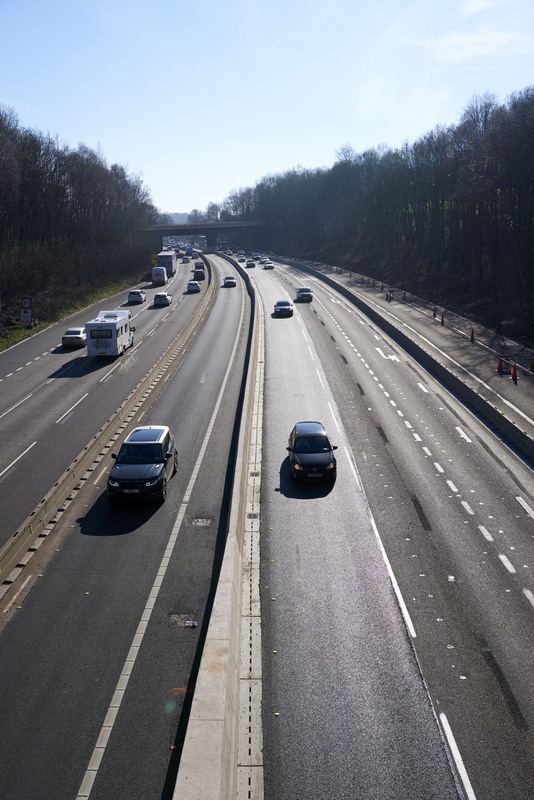 We're upgrading the busy 28km stretch of the M6 between junction 13 at Stafford and Junction 15 near Newcastle under Lyme and Stoke on Trent to make it a smart motorway. We're expecting to start the main construction work in March 2018 and plan to complete the scheme by March 2022. Location : The M6 southbound between junctions J15 and J14 . Lane Closures : Lanes 1, 2 and 3 will be closed. Reason : Roadworks are planned. Status : Pending. Schedule : Expect disruption everyday between 21:00 and 06:00 from 29 April 2019 to 4 May 2019. Lanes Closed : All lanes will be closed. Location : The M6 northbound entry slip at junction J14 . Reason : Roadworks. Status : Currently Active. Period : expect disruption until 23:59 on 28 April 2019. Location : The M6 northbound exit slip at junction J14 . Lane Closures : Lanes 1 and 2 will be closed. Reason : Roadworks are planned. Status : Pending. Schedule : Expect disruption everyday between 21:00 and 06:00 from 26 April 2019 to 28 April 2019. Lanes Closed : All lanes will be closed. Location : The M6 northbound between junctions J14 and J15 . Reason : Roadworks. Status : Currently Active. Period : expect disruption until 23:59 on 28 April 2019. Location : The M6 southbound exit slip at junction J13 . Lane Closures : Lanes 1 and 2 will be closed. Reason : Roadworks are planned. Status : Pending. Schedule : Expect disruption everyday between 21:00 and 06:00 from 29 April 2019 to 4 May 2019. Lanes Closed : All lanes will be closed. Location : The M6 northbound between junctions J12 and J13 . Reason : Roadworks. Status : Currently Active. Period : expect disruption until 23:59 on 28 April 2019. Location : The M6 northbound between junctions J12 and J13 . Lane Closures : Lanes 3 and 4 will be closed. Reason : Roadworks are planned. Status : Pending. Schedule : From 21:00 on 29 April 2019 to 05:00 on 30 April 2019. Lanes Closed : There will be two of four lanes closed. Location : The M6 southbound between junctions J13 and J12 . Lane Closures : Lanes 3 and 4 will be closed. Reason : Roadworks are planned. Status : Pending. Schedule : From 21:00 on 29 April 2019 to 05:00 on 30 April 2019. Lanes Closed : There will be two of four lanes closed. Location : The M6 southbound between junctions J14 and J12 . Reason : Roadworks scheme is planned. Status : Pending. Schedule : From 21:00 on 29 April 2019 to 06:00 on 4 May 2019. Location : The M6 southbound between junctions J15 and J14 . Lane Closures : Lanes 1 and 2 will be closed. Reason : Roadworks are planned. Status : Pending. Schedule : Expect disruption everyday between 21:00 and 06:00 from 29 April 2019 to 4 May 2019. Schedule : Expect disruption everyday between 21:00 and 06:00 from 7 May 2019 to 11 May 2019. Schedule : Expect disruption everyday between 21:00 and 06:00 from 13 May 2019 to 18 May 2019. Schedule : Expect disruption everyday between 21:00 and 06:00 from 20 May 2019 to 24 May 2019. Lanes Closed : There will be two of three lanes closed. Location : The M6 southbound between junctions J14 and J12 . Lane Closures : Lane one will be closed. Reason : Roadworks are planned. Status : Pending. Schedule : Expect disruption everyday between 21:00 and 06:00 from 29 April 2019 to 4 May 2019. Lanes Closed : All lanes will be closed. Location : The M6 northbound exit slip at junction J14 . Reason : Roadworks. Status : Currently Active. Period : expect disruption until 23:59 on 28 April 2019. Location : The M6 northbound between junctions J13 and J14 . Lane Closures : Lanes 2 and 3 will be closed. Reason : Emergency barrier repairs are planned. Status : Pending. Schedule : From 21:00 on 29 April 2019 to 06:00 on 1 May 2019. Lanes Closed : There will be two of three lanes closed. Location : The M6 northbound between junctions J12 and J15 . Reason : Roadworks scheme. Status : Currently Active. Period : from 15:03 on 17 April 2019 to 06:00 on 28 April 2019. Location : The M6 northbound between junctions J13 and J14 . Lane Closures : Lanes 1, 2 and 3 will be closed. Reason : Roadworks are planned. Status : Pending. Schedule : Expect disruption everyday between 21:00 and 06:00 from 26 April 2019 to 28 April 2019. Lanes Closed : All lanes will be closed. Location : The M6 southbound between junctions J15 and J14 . Lane Closures : Lane one will be closed. Reason : Roadworks are planned. Status : Pending. Schedule : Expect disruption everyday between 21:00 and 06:00 from 29 April 2019 to 4 May 2019. Lanes Closed : There will be one of three lanes closed. Location : The M6 northbound between junctions J13 and J14 . Reason : Roadworks. Status : Currently Active. Period : from 15:05 on 17 April 2019 to 06:00 on 28 April 2019. Location : The M6 southbound between junctions J13 and J12 . Reason : Roadworks. Status : Currently Active. Period : expect disruption until 23:59 on 28 April 2019. Location : The M6 northbound between junctions J13 and J14 . Reason : Roadworks. Status : Currently Active. Period : expect disruption until 23:59 on 28 April 2019. Location : The M6 southbound between junctions J15 and J12 . Reason : Roadworks scheme. Status : Currently Active. Period : from 12:20 on 17 October 2018 to 23:59 on 28 April 2019. Location : The M6 southbound between junctions J12 and J11A . Lane Closures : Lane one will be closed. Reason : Roadworks are planned. Status : Pending. Schedule : From 21:00 on 26 April 2019 to 06:30 on 27 April 2019. Schedule : Expect disruption everyday between 21:00 and 06:30 from 29 April 2019 to 4 May 2019. Schedule : Expect disruption everyday between 21:00 and 06:30 from 7 May 2019 to 11 May 2019. Schedule : Expect disruption everyday between 21:00 and 06:30 from 13 May 2019 to 18 May 2019. Lanes Closed : There will be one of four lanes closed. Location : The M6 southbound between junctions J15 and J13 . Reason : Roadworks. Status : Currently Active. Period : expect disruption until 23:59 on 28 April 2019. Location : The M6 northbound entry slip at junction J13 . Lane Closures : Lanes 1 and 2 will be closed. Reason : Roadworks are planned. Status : Pending. Schedule : Expect disruption everyday between 21:00 and 06:00 from 25 April 2019 to 28 April 2019. Lanes Closed : All lanes will be closed. Location : The M6 northbound between junctions J14 and J15 . Reason : Roadworks scheme. Status : Currently Active. Period : from 12:21 on 17 October 2018 to 23:59 on 28 April 2019.